Closer to Completion: New Construction on the Met Branch Trail! 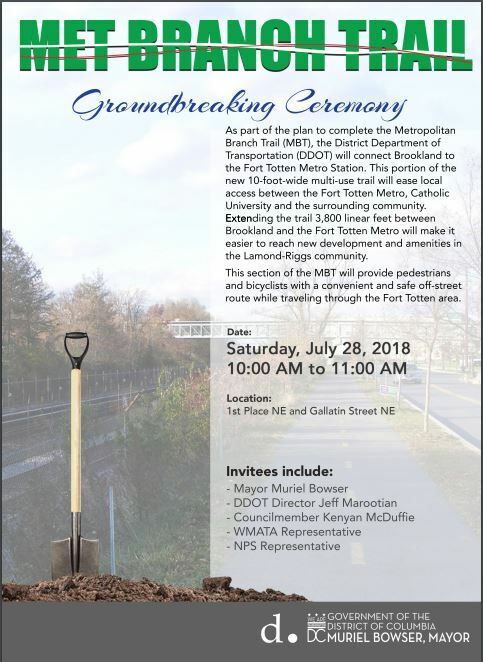 This Saturday at 10am, DDOT is breaking ground on the next phase of the Metropolitan Branch Trail that will connect Brookland to Fort Totten Metro station. There hasn’t been any major construction on the MBT since 2013, so this is a huge win! After a handful of delays, in November 2017, DDOT awarded the contract to complete design and begin construction on the next phase of the popular multi-use trail. WABA’s been working on getting this trail built since the 1990s; this new construction will link the trail to the Fort Totten Metro Station, provide direct access to three new neighborhoods, and cut out the steep (and smelly) Fort Totten hill. And it moves the Met Branch Trail one step closer to completion. Once complete, the MBT will connect Silver Spring to Union Station, in a mix of on and off-road trail. The trail will also be a key connection the East Coast Greenway, the largest connected walking and biking route in the nation. Topics: Uncategorized. Tags: DDOT, groundbreaking, met branch trail.